Fresh from solving Memphis' most sensational murder case, Homicide Detective Billy Able and his ambitious new partner Frankie Malone are called to a bizarre crime scene on the outskirts of town. A high society attorney has been murdered while dressed in a wedding gown. Billy is shocked to discover he has a very personal connection to the victim. When the attorney's death exposes illegal practices at her family's prestigious law firm, the scandal is enough to rock the southern city's social world. In a tale of the remnants of Old South aristocracy and entitlement, twisted by greed and vengeance, Billy must confront the secrets of his own past to have any chance at solving the murder of the girl he once knew. But as he seeks the truth, he's drawn closer to an embittered killer bent on revenge—and eliminating the threat Billy poses. Memphis police detective Billy Able is back after a nine-month-long hiatus. His previous case was high profile amongst the wealthy and elite Southern gentry. 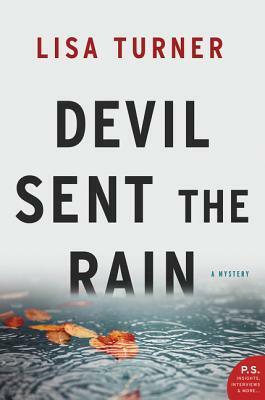 Now he's facing another high-profile case, the murder of young female attorney from a monied Southern family in Devil Sent the Rain by Lisa Turner. After his last case, Billy Able took time off from the Memphis Police Department and followed his lover to Atlanta. When that relationship began to fizzle out, he returned to Memphis and work. Now he must deal with a high-profile case that involves someone from his past, a childhood friend and former girlfriend. Caroline Lee was murdered under very strange and mysterious circumstances. After breaking her engagement to Dr. Raj Sharma, a renowned neurosurgeon, she apparently was on her way to get married...but no one knows who the groom was going to be. Billy must wade through Caroline's past in his attempt to uncover the murder but his investigation dislodges a missing person's case, family members with plenty of secrets to hide, a jealous ex-fiance and more. Can he discover the murderer before it's too late? Devil Sent the Rain is the second book in the Billy Able series by Lisa Turner, following The Gone Dead Train. This Southern gothic mystery provides more than just murder, there's a missing person's case (Caroline's cousin) that may or may not be linked to Caroline's murder, a con-artist, embezzlement, alcoholism, drug addiction, and of course the politics of dealing with a family that wants to keep their secrets hidden. I enjoyed the partnership between Billy Able and Frankie Malone and only wish that their investigative partnership had a more prominent role in the story. If you enjoy reading mysteries then I recommend you add Devil Sent the Rain to your TBR list. This was the first book I've read by Ms. Turner and I plan on spending part of my weekend reading The Gone Dead Train. I look forward to reading more in the Billy Able series in the future. I hope you enjoy THE GONE DEAD TRAIN as much as you enjoyed this one!